Load the barbell with a weight that will only allow for a few strict, good-formed repetitions. Note: You may use a straight bar or an E-Z curl bar. Standing, grasp the barbell at shoulder-width and let it rest against your thighs. Lower the weight, inhaling throughout the movement. Now, since you loaded a heavy amount of weight that only allows for a few repetitions, you will need to break proper form and swing the weight upward for each remaining repetition to complete your set. Use your shoulders and back to do so, but be cautious because (as most of us have been rightly told) swinging weights and lifting with backs, especially jointly, is dangerous. See "Things To Look Out For" below for elaboration and tips to reduce the likelihood of injury. Cheat curls are meant to be done with heavy weights. The barbell should be loaded with a weight that only allows for a few strict, initial repetitions. After the first few repetitions are completed and you can no longer lift any more, you will need to break proper form to complete your set. If using dumbbells cheat curls may be done with a neutral grip (palms facing each other). To emphasize the biceps brachii, which is the traditional way to perform cheat curls, keep your forearm supinated (so that your thumb is pointed outward, i.e. your palm is facing outward/forward in respect to your body); to incorporate more brachioradialis, pronate your forearm (so that your thumb is pointed up, i.e. your palm is facing inward in respect to your body). The latter description, with the grip in a neutral position is the "hammer curl" variety of curls. Keep your core tight. Cheat curls are inherently dangerous being as they involve swinging the weight, and, well, "cheating" with your back. For this reason, only advanced lifters in full health should perform this exercise. As stated in the performance description, since you loaded a heavy amount of weight that only allows for a few repetitions, you will need to break proper form and swing the weight upward for each remaining repetition to complete your set. Use your shoulders and back to do so, but be cautious because doing so is dangerous and may result in injury. Keeping your core (abdominals and low back musculature) isometrically flexed, along with good technique will help in avoiding injury. 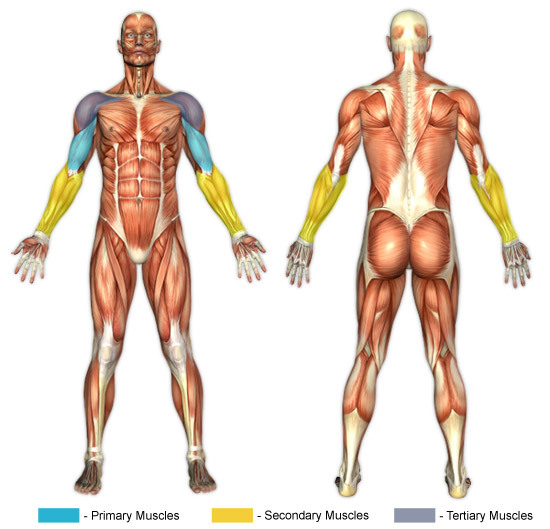 Isometric flexing simply means that the muscle is contracted without changing its length. Do not allow the weight to slam at the bottom portion of the movement. Keep in mind that letting the weight rapidly drop or slam as the elbow reaches the bottom "locked" position causes tremendous stress on it that will eventually likely result in injury. So even though the "cheating" motion is necessarily a part of this curling exercise, it is recommended to heed to the bottom aspect of the curl. Slowing the momentum of the weight or stopping just short of fully extending your arms (locking out the elbows) is recommended. Keep your elbows fixed at your side throughout the movement, especially if you are a not an experienced lifter. Many people can raise their elbows (forward) at the top of the curl movement without becoming injured, though by raising the elbows the anterior deltoids become far more involved. With cheat curls, raising the elbows is more acceptable due to the forced, swinging nature of the lift; but this does not make it safe, even for some advanced lifters. There are experts who claim that raising the elbow(s) forward allows for a fuller contraction of the biceps. Regardless, use good judgment when determining whether or not you can safely perform cheat curls this way.